Boston, MA and Arlington, VA, September 10, 2014 – Families can join everyone’s favorite aardvark for the premiere of season 18 of ARTHUR, beginning September 29 on PBS KIDS (check local listings). Produced by WGBH, this Emmy Award-winning PBS KIDS series explores childhood challenges with heart and humor, while teaching problem-solving and pro-social skills. This season, imaginations run wild as Arthur and friends embark on all-new adventures — from funny and original storylines about everyday life to tongue-in-cheek parodies of film noir, The Wizard of Oz, and The Tell-Tale Heart. In the new episodes, families will follow the familiar and beloved cast of characters as they explore the bewitched halls of Muffy’s basement, hunt for clues in a puzzling mystery, and attempt to sneak their way onto Wonder World’s new, chill-inducing rollercoaster. Along the way, the characters will learn valuable lessons about honesty, empathy, and determination. “The return of Buster Baxter Private Eye, a horde of angry penguins, and D.W. in ruby red slippers? Season 18 has it all and you don’t want to miss any of it, trust us!” says Carol Greenwald, senior executive producer of ARTHUR. On the ARTHUR website, kids, parents, caregivers, and teachers can access a variety of fun and educational games, lesson plans, and activities. Families can also keep up with Arthur and his friends on the new ARTHUR Family Health Website — a resource that helps caregivers and children build and maintain healthy living habits. 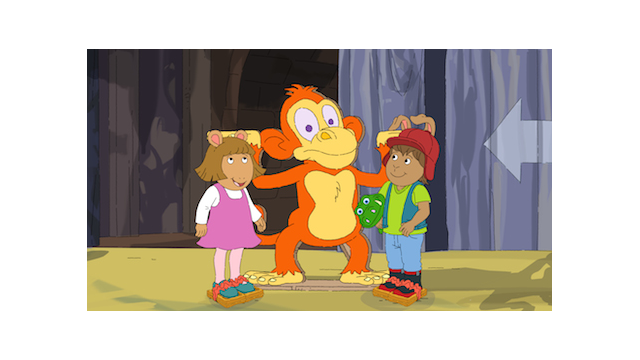 For images, episode descriptions, and more information on ARTHUR, visit PBS PressRoom. Episodes descriptions and air dates for the season 18 premiere episodes follow. The Friend Who Wasn’t There: Muffy embarks on an epic quest to find her long-lost imaginary friend. But she has to be careful — the Crosswire basement is full of bewitched boxes and gadgets and dolls…oh my! Surprise! : It’s Catherine’s 16th birthday and Francine has been cordially UN-invited to the party. With the help of her friends, Francine whips up the perfect present for her big sister…a sneaky surprise with a side of payback! The Substitute Arthur: With Arthur out of town, Buster is on the hunt for a new best friend. Problem is, Buster only wants to play games HIS way. Will Buster learn to compromise or is he destined to play alone? The Tattletale Frog: When Bud is blamed for an accident D.W. causes, she has to decide whether to let her friend take the fall. D.W. & Bud’s Higher Purpose: D.W. and Bud can’t wait to ride “The Buzzard,” Wonder World’s newest rollercoaster! Will they make it past the persnickety ticket taker…or will they come up short? Best Wishes: After George has a lucky streak, his friends pressure him to wish for a snow day. Can George deliver or is he out of luck? The Tardy Tumbler: Prunella is excited about making the gymnastics team…until she realizes practice starts at 6:00 in the morning! Can she honor her commitment or will she hit the snooze button? ARTHUR, based on the best-selling books by Marc Brown, is television's longest-running children’s animated series. Over the past 17 seasons, ARTHUR has remained one of the highest-rated weekday children’s series on PBS among children 4-8. ARTHUR has won numerous awards, including the George Foster Peabody Award, a BAFTA, and seven Daytime Emmys®-four for Outstanding Children’s Animated Program. ARTHUR is produced by WGBH Boston and 9 Story Entertainment. Executive producers are Carol Greenwald (WGBH), Vince Commisso (9 Story), and Marc Brown (Marc Brown Studios). Directed by Greg Bailey. Funding for Arthur is provided by public television viewers. Corporate funding is provided by Chuck E. Cheese’s®. For more information, visit pbskids.org/arthur and follow ARTHUR on Facebook and Twitter. WGBH Boston is America’s preeminent public broadcaster and the largest producer of PBS content for TV and the web. Television channels include WGBH 2, WGBX 44, and the digital channels World and Create. WGBH Radio serves listeners across New England with 89.7 WGBH Boston Public Radio; 99.5 WCRB; and WCAI, the Cape and Islands NPR® Station. Find more information at wgbh.org.